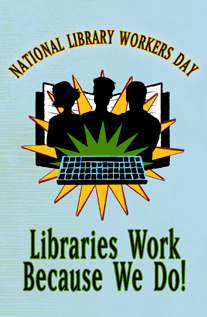 Day two of National Library Week, and today is was National Library Workers’ Day! We had a great day today at the library, though Tuesdays are always long since I close. (we close at 9pm! Can you believe it?) My boss JW and coworker OP went and grabbed us some Starbucks before the night shift started, though, and I thoroughly appreciated my hot chocolate! (Not a coffee drinker!) 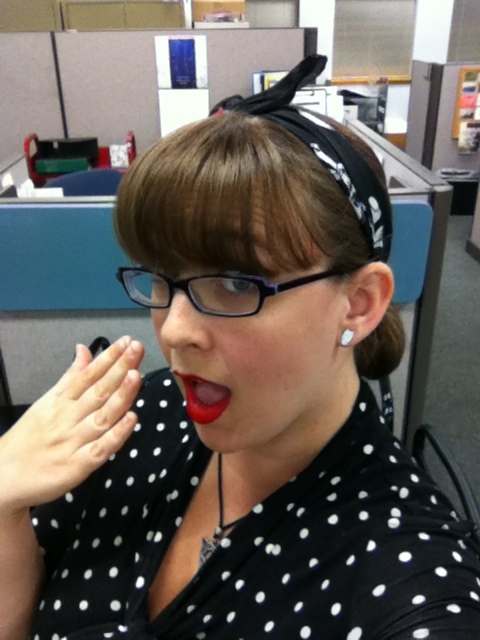 I did make sure to look extra peppy though, with my pseudo-rockabilly-pinup style. Cheese! Dig my skull and crossbones bandanna, and tiny owl earrings! I am actually all of these. Especially Barbara Gordon/Batgirl. But really what we do is make libraries WORK. You can’t have a library without staff! I shared the above picture on my personal Facebook page today, with the caption “Love your library workers! Especially me!” and boy have I been feeling the love! 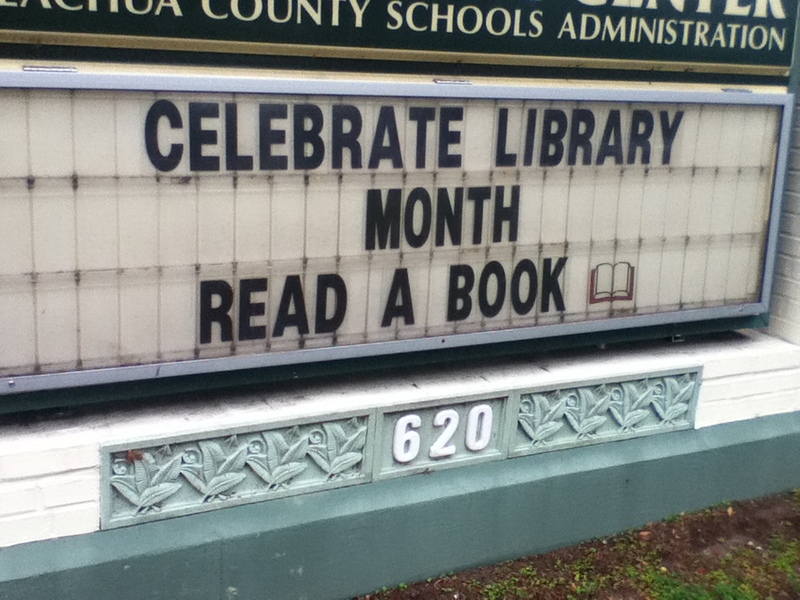 For example: the marquee in front of the school district building where I park has been changed to reflect School Library Month. Check it out, they’ve even got a cute little book tile! 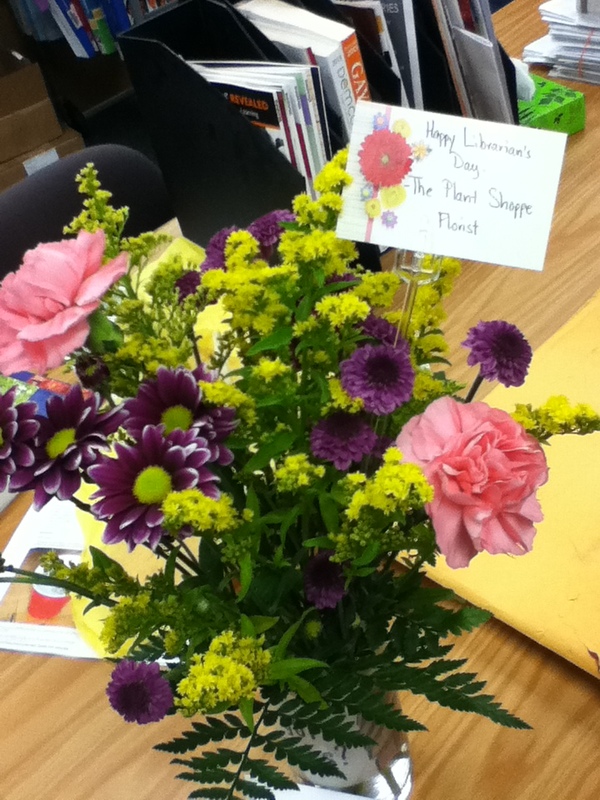 My day today was really made though when I got to work and discovered that we had received a beautiful bouquet of flowers from The Plant Shoppe here in town to thank us for being library workers! Very sweet! Cool, right? 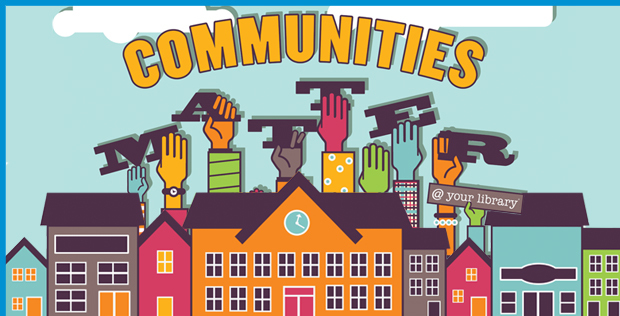 The community is what make a library what it is; it serves as the hub for all different types of people to come together as equals, to share information, and generally make the world a better place. After the awfulness of yesterday’s tragic events in Boston, the national (and global) library community is coming together to help get Boston and her libraries back on their feet. One of the victims was the son of a school librarian, the explosion happened near the downtown Boston Public Library, and there was also an unrelated fire at the JFK Library the same day, so it all hit especially close to our library hearts. But when tragedy strikes, people need two things: community support, and information. The library and its staff provide these things on a daily basis, even more so in time of crisis. I want to give a shout out to Google as well, for creating the amazing “Person Finder” to help people find each other. An online community is still a community and Google is an honorary library worker in my book! All we can do is support and love each other, work toward peace, and continue learning, sharing, and educating. This week is also National Public Safety Telecommunications Week, and I want to thank my friend Toni and all the calltakers,dispatchers, and technicians (ESPECIALLY those manning the lines in Boston yesterday) that are always there to help during emergencies. Thank you for your support! Tomorrow: A video? More blogging? Both?! Stay tuned and keep bookaneering! Giving a special shout-out to YA librarians for helping me find books that are like Percy Jackson for my son. Thing1 has done Harry Potter and all of Rick Riordan books, and now he's working on the Myth-O-Mania books. YA librarians are the best!